What is the largest land animal on this planet? The answer is the Loch Ness Monster when it comes out of the water to make its rare excursions onto terra firma. In making such a statement, we enter a twilight world of strange and misshapen giants seen by incredulous and terrified witnesses reclining on pebble shores, dashing across roads and slithering back into murky depths. They are derided as ludicrous by sceptics and hailed as important by believers. The genre stretches back to the ancient days of the demonic Water Horse waiting on land for its next victim and it continues right up to the present day. These are the "Close Encounters of the Third Kind" in Loch Ness cryptozoology, such is the fascination they hold with people including myself. Back in 1933, it was a land sighting that catapulted the creature to national and international fame and there has been a steady stream of tales of lumbering leviathans that has intensified the mystery as to what this beast could possibly be. The picture above exemplifies the mystery. It is a reproduction of what George Spicer and his wife claimed to have seen back in August 1933. Using Google Maps and Street View, an approximation to the witnesses' location is made. A modern car is in place about 200 metres from our "creature" to give an idea of scale and the superimposed picture of the beast is taken from Alan Jones' painting which is itself based on the drawing the Spicers sent to Constance Whyte for her 1957 book "More Than A Legend". You can click on the image to enlarge it. In the months ahead we will showcase various stories and ideas but for now we give the overview of cases. 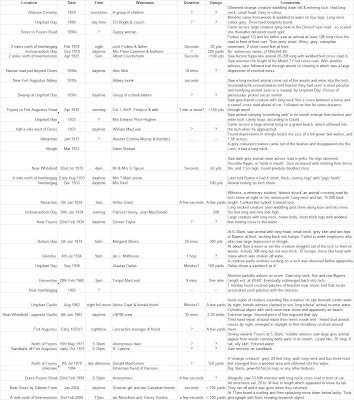 The tight textual columns of blogging does not lend itself to detailed tables so the spreadsheet of land sightings I have is supplied as an image which you should click on for a readable view. Credit is given to Fortean researcher Mike Dash who supplied the initial table to which I added further data. By data we mean all the incidents claimed over the years. Undoubtedly, some of them will be hoaxes or misidentification. The Grant, Hughes and Dallas cases are certainly claimed as hoaxes (I pass no comment at this point) but it is our contention that misidentification is far less likely in these cases than water based sightings. 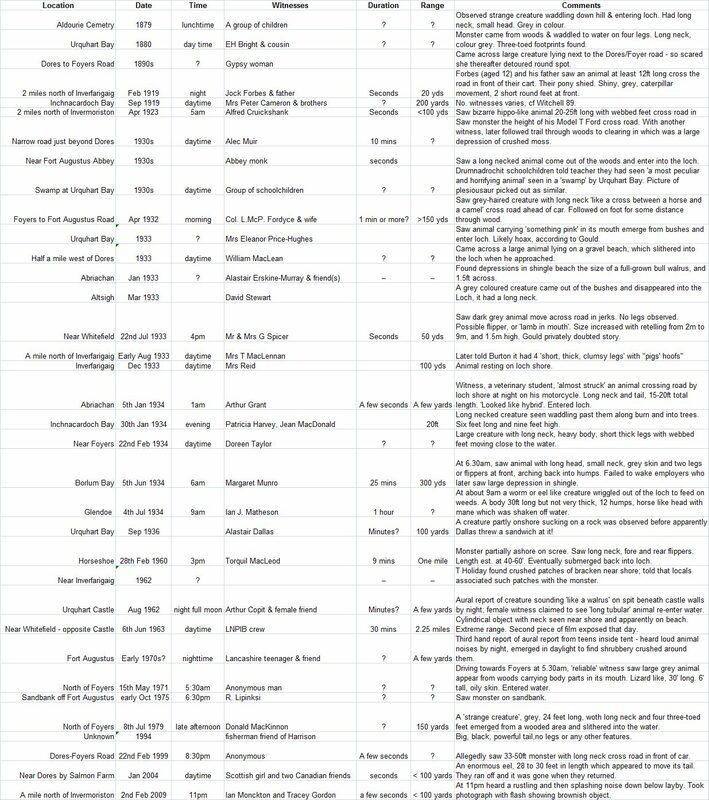 These sightings occured over a 130 year period. This works out at one case every 4 years on average. Land sightings are at least 30 times rarer than water sightings. There were seven sightings before the "Nessie" era. Fifteen sightings occured during the 1930s "flap". Thirteen sightings are noted from the 1960s. There are "silent" periods from 1937-1959 and 1980-1993. Many cases are close up (less than 100 metres). Note also that the cases will vary in degree of "strangeness". For example, three cases are based on discoveries of depressions while others are just a bit too strange (I think of the Fordyce case). The close proximity of many sightings underlines the lesser margin for error. Of the 17 cases where a distance is mentioned, 11 (65%) are stated to be at 100 yards or less. On the negative side, 26% occur at night time which makes observation of detail less likely. However, estimation of overall size is easier when the creature is seen against various frames of reference such as roads, trees, rivers, etc. Morphology is also an interesting factor but we will leave that for another day. The distribution of sightings as best as I can figure are plotted on the map below. One place of interest is what I jokingly call "Monster Alley". It is part of the road on the south side which runs between the villages of Foyers and Whitefield. This six mile stretch of the B852 has 32% of all the reports yet consititues only 12% of loch side road. It also carries less traffic than the other side of the loch and hence less potential witnesses. At a guess we would suggests a third less over the 130 year period (even less during the modern era). This gives an expected ratio of only 4% of total sightings - yet it carries 32%. Why would this be the case? It is to be noted that the loch is much closer to the shore and road than it is elsewhere. By this we mean there are no sheer drops but it is also to be noted that other stretches such as beyond Inchnacardoch Bay to Invermoriston have similar topography but zero incidents. So why is this stretch of road more significant to sightings? Perhaps the underwater shelf of Loch Ness is shallower along this stretch allowing easier water to land progression for such creatures? Again, a look at a 2003 Kongsberg sonar map I have shows no advantage in this area. In fact, the shallower areas tend to be at the river outlets (Oich, Moristion, Enrick, Foyers and Ness rivers) and the top end of the loch. Until a better explanation is forthcoming, this remains a statistical anomaly. 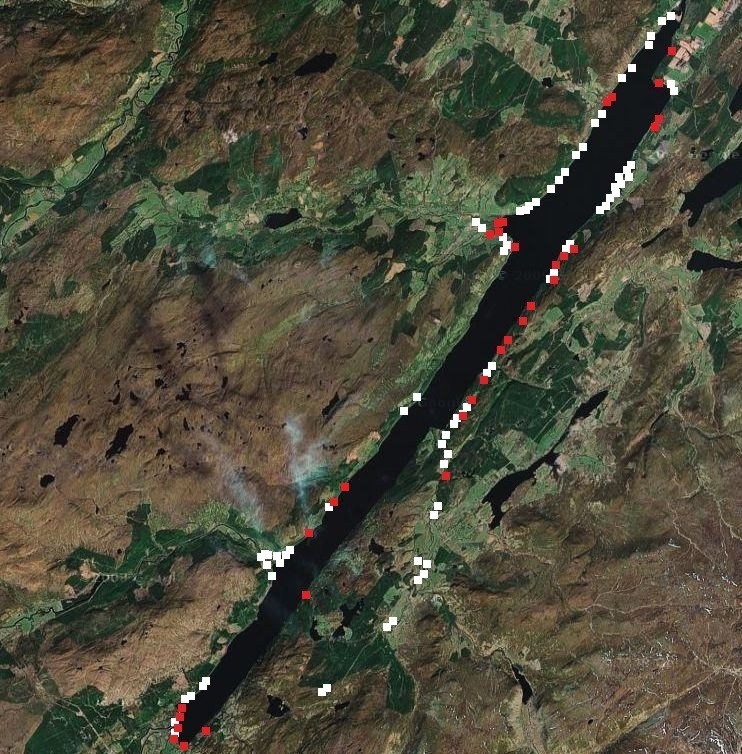 However, there are also higher "spot" concentrations of incidents in the Fort Augustus and Urquhart Bay areas. One may argue this is because these are higher population centres but then again Invermoriston and Foyers do not seem well represented in that case. Finally, what about deer population versus monster incidents? How often do deer go near the loch side for food and water? The answer is nobody knows for sure but since some sceptics claim these witnesses are seeing only these normal but largish animals it is worth a further look. One avenue of research is deer roadkill incidents. It is a reasonable assumption to say that incidences of deer road kill is proportional to the presence of deer on or near the shoreline. I emailed the National Deer Vehicle Collisions Project for data along Loch Ness roads and was supplied with a map from which I have created the following map. Deer kill recoveries are in white while Monster incidents are in red. I would note first that the DVC data covers reported recovery of deer carcasses from 2003-2010. Secondly, it is to be noted that since car traffic is less on the south side then there has to be some weighting factor to account for this. What that factor is has proven to be somewhat difficult since we have to take into account car traffic volume, car speed, blind spots and deer population compared to the busier north side. In the end, I went for a weighting factor of 3:1. The main thing to note is the lack of correlation between deer incidents and monster incidents. If people were mistaking deer for monsters we would expect more red on white but this is not the case. This does not preclude a few making that mistake but certainly this should not be considered a major explanation of claimed land sightings of the Loch Ness Monster. The other point to make is why these land sightings only occur once every four years if they are purely down to deer, etc misidentification. In terms of chronology, of those reports where we reasonably know the time of day, 53% occured in daylight but 26% occured at night which is yet another interesting statistic considering how far fewer people are out and about at night. This would suggest the creature is far more likely to come ashore when it is dark. If we assume a 10:1 weighting of people out at day:night, the nighttime percentage should be more like 10% than 26%. In terms of dates, it turns out that February was the most frequent month taking in 25% of all reports where the month is known. This compares to the statistical average of 8%. So from these it seems that the best way to see the Loch Ness Monster on land is on the stretch of road between Foyers and Whitefield at night time in February. I would suggest your chances go up 130 fold (32/4 * 26/10 * 25/8) which means you have an 11 day wait instead of 4 years. Doesn't statistics make everything sound so optimistic? Good luck with those freezing 3am February watches north of Foyers! "I must say, here, that I find it quite incredible that anyone can believe any of these ridiculous land sighting reports. Surely they do nothing but confuse the whole subject?" "I saw what I saw. It was the monster of the Loch all right ... The scientists at the Loch have got it all wrong, I'm telling you." Who should you believe the most? The sceptic or the witness? Let everyone be persuaded in their own minds.